i’m new in PlatformIO forum. SOME .h FILES ARE MISSING !!! These pin definitions seem to be for a Arduino Uno/Mega type where it’s Analog Pin 5. Change that to the pin where you have the receiver enable / transmitter enable etc. Can e.g. be done by defining the macro via build_flags = -D RS845_DEFAULT_DE_PIN=12 or whatever in the platformio.ini. It seems there is a small misunderstanding !! it seems i need another lib for the default RS485 parts ?? I think: “…take original Arduino libs, they must still be compatibel …” or ? is not enough. There must be a deeper includ before ? Oh okay you’re trying to do Modbus via TCP/IP not via an actual RS485 transceiver. Seems you have the wrong library for that? 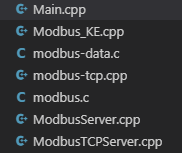 Does the ArduinoModbus library say it can do TCP/IP Modbus? but they discribe the pysical layer is always RS485 based. Thatsway we need RS485 ?!?!? maybe you have another solution, with other PlatformIO libraries ? Uh seems like you want https://platformio.org/lib/show/5902/esp32ModbusTCP or https://platformio.org/lib/show/1736/ModbusIP_ESP8266? Found via https://platformio.org/lib. First one only implements a client. But i will try it tomorrow, and let you know wkat happens. First try: i always append only the include files to see what happens. 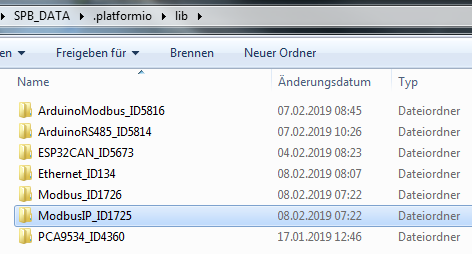 This one would probably never work, as it clearly states on the Library Registry it is for the Teensy platform, not the ESP32! For the esp32ModbusTCP library (id:5902), it looks like the author of that library has been making changes to the library and neglected to update the the example. Change the include and the object initialisation to the following (i.e esp32ModbusTCP instead of ModbusTCP). It’ll then start to compile, but then hit an 'esp32ModbusInternals' has not been declared error. I’m not sure why that is happening, as it appears esp32ModbusInternals is declared in Helper.h which is included by esp32ModbusTCP.cpp . Anyway, this is my platformio.ini and compile output. I give the ModbusTCP a chance, and actual it works for me. Why: Because the examples are working and i need a Server/Slave mode. Modbus Library with ID5816 is working for me. I can define 20 InputRegisters and can read them in 10 Hz from the PC.